How Augmented Reality Is Transforming The E-commerce Industry? The introduction of Augmented Reality, already propelling the e-commerce industry to widen its horizons and enhance customer experience. This technology is powering the digital information with real-life to create a new experience for the users (with an ideal integration). The beauty of the advanced technology lies its reliance on smartphones and tablets, (with which the users are quite familiar) no hardware is required. In the year 2016 over $17 billion was invested in the advanced development of augmented reality technology. And, the last decade owes a considerable increase in consumer's interest to actively participate in the digital realm. The numbers also leave a remarkable impact, as the Statista reveals that e-commerce sale amounted to 2.3 trillion US dollars in the year 2017. Well, Augmented reality does not require any proof to explain its worthiness, rather the presence can be already seen in different industry verticals like healthcare, oil & gas, tourism, marketing and online Retail. Today, the E-commerce Development Services are not limited to responsive website development rather, it is taking on advanced technology like AI, AR/VR, and Chatbot integration. Lead by the good fortunes, the e-commerce industry finds leveraging Augmented Reality as a potential tool to bridge the gap between offline and online shopping experience. With the AR-based e-commerce apps, the customers can make the confident purchase and are able to make the right choices. On a research on Customer expectation – it was found that 22% to avoid traditional retail stores if AR would be available in online stores. The source from Techcrunch, - the AR market will be worth approximately $83 billion by 2021. For instance; Amazon and Walmarts back name in the list of biggest retail brands. However, Amazon is clearly winning the retail embracing its presence in the world of online retail for 20 years, this company is the early bird to adopt this technology to enhance customer experience. Along with simplicity, Amazon is a familiar platform - selling everything you can think of – it’s has been of the most innovative players in the market and beautifully picturesque today’s online shopping experience. It has successfully created a new paragon for what shopping in the world is like. Understanding the soaring demand for AR-based mobile apps in the near future, technology giants like Apple and Google have come up with their own Augmented Reality platforms. And these platforms have made it simple for developers to build e-commerce apps possessing AR features. In order to build Augmented Reality iOS apps, the iOS developers can take help of ARKit. The kit lessens the effort and time of developers in developing apps that seamlessly blend digital objects and ample information with the real-world environment. ARCore - a software development kit to build AR based Android app to build innovative apps. This kit contains a wide range of tools that developers require to build genuine bets with AR that flawlessly combine the virtual and real world. Once, you have decide to integrate VR into your app, the next step is to define what kind of AR application will fulfills your exact business retail business requirement. This type of application employs a predefined marker (such as a QR code or picture) to superimpose images into the physical world. These applications can identify patterns, colors, and other properties within a frame. For instance; the Big brand Harley Davidson has a great markerless AR app that helps users to actually identify the real color or related stuffs to make the right buying decision. Location-based apps are a type of markerless AR - it utilizes the device GPS location to produce visual elements. This sort of AR app protrudes lights onto a 3D model to conceive a realistic looking article. 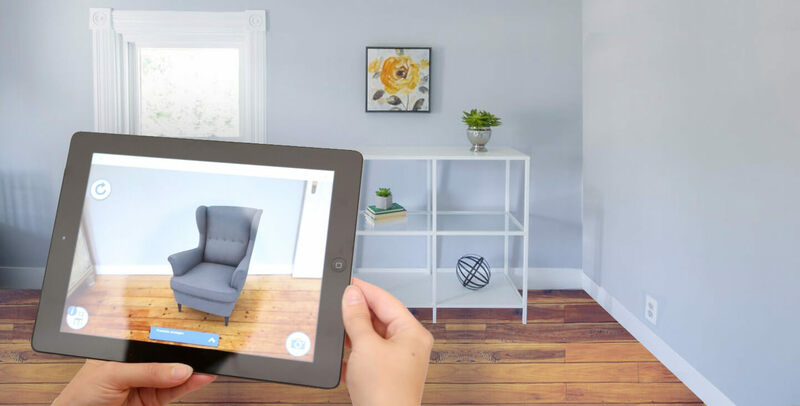 This retailer’s, (ARKit ) Augmented Reality e-commerce app is the first app to revolutionize the online retail shopping. It takes furniture objects out of the screen and places them in the real space, allowing interaction of virtual products with the real world in a whole new approach. The uniqueness that attracts the user's for IKEA app - it facilitates users can place the furniture products home, to get the view whether it will suit the interior/ or how it appears in the living area before they actually buy it. This feature allows users to have the right estimate of the size of the box for packaging the selected item. AR powered eBay app superimposes a packaging box from its collection of standard box sizes (the variable size box are available including small, medium top loading, medium side loading, large top loading and many more). Thus, it allows users to get the actual idea, "what type and size of the box perfectly fit the item" and helps in making the right purchase. Online fashion retailer Banana Flame (in association with Zugara- a software company) introduced an Augmented Reality shopping app for the online shopper allowing them to virtually 'try on' clothes. This measure is practiced after examining that " most of the customers drop the idea of purchasing clothes" just because they are not able to try it. Amazon- an electronic commerce, and cloud computing company. The company has added ‘AR View’ feature in its application provide easy shopping for online user. it offers the AR view feature for some of the products. Further, the company is working forward to add more products with advancing time, to this list, enabling shoppers to test the look and feel of it. Generally, the AR app development cost depends on the number of features that will be added in the app, the total time estimation, and the platform used. We recommend to start with an MVP (Minimum viable product) for one platform and it further helps to keep the development improving on it. By 2020, the Augmented reality is expected to grow to $120 billion in revenue. The AR will take on e-commerce industry with its ability to personalize and enhance user's buying experience online. Therefore, if you want to boost your online business, hire expert augmented reality app development company, as the experienced and skilled team of augmented reality helps to add value and enhance customers’ online shopping experience. Start Your Planning to Add AR in Your Business? Our highly experienced AR/VR experts will help implement advanced AR features to your respective eCommerce store. Avail our Instant Support to create a success story! March 02 2019Node.Js For Web Application Development - Pros & Cons!